The GOS-635G and GOS-622G are general purpose analog oscilloscopes with 35MHz and 20MHz bandwidth, respectively. These products are designed for a wide range of applications ranging from product designs or assembly lines to EE laboratories or class experiments. Featuring a low vertical sensitivity at 1mV/div and versatile triggering, the GOS-635G and GOS-622G can reliably capture small signals. 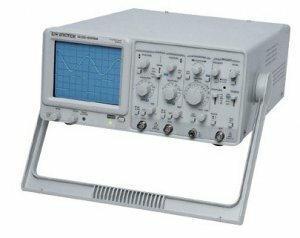 The GOS-635G/622G is the highest performance/price solution in the Test & Measurement market.